Kundapur, Apr 06, 2019: The Forest Department trapped a leopard at Heskethur village in Kundapur taluk on Friday. The leopard had pounced and injured a calf a couple of days ago at Heskethur. Hence, the department kept a cage to trap the leopard with a dog as bait in a separate compartment of the cage. The leopard got trapped at around 2 a.m. The department staff then took away the cage from the village at around 7 a.m.
Prabhakar Kulal, Range Forest Officer, Kundapur Range, told The Hindu that it was a six-year-old healthy leopard. The wild cat was later released in the forests of the Mookambika Wildlife Sanctuary, he said. There were complaints of about 10 calves being eaten by the leopards in the villages of Kedur, Heskethur, Japti and Korgi for the last two months. Some people had also complained that they had seen a couple of leopards roaming in these areas. These leopards were roaming in the shrubs around. “This could also be because of an increase in the number of leopards,” Mr. Kulal said. There was a complaint of a goat being carried away by leopard at Kattgeri hamlet on March 3. 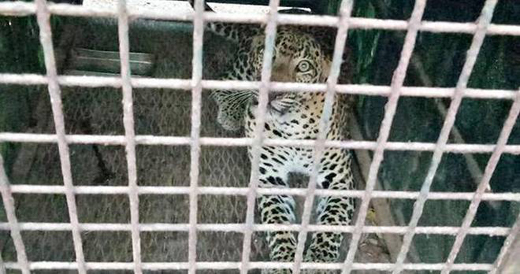 The Department had kept a cage to trap the leopard at Kattgeri on March 4, he said.